AUGUSTA, Maine — A stack of bills aimed at cleaning up Maine’s public election financing law holds the potential to rankle political leaders on both sides of the aisle. Rep. Justin Chenette, D-Saco, said he knows leadership is displeased with his efforts to stop candidates who are seeking state office from also running political action committees that can filter money back to a political party, which in turn can use it to support a candidate or oppose a rival. According to Chenette and others, the practice creates a virtual black hole in Maine’s campaign finance law, allowing candidates the cover of their party when attacking opponents. State law also allows candidates who are running publicly funded campaigns, under the state’s Clean Election law, to separately manage so-called “leadership PACs” and collect private donations from industry lobbyists and others. Under the Maine Clean Election Act, a candidate who chooses to run with public financing for a House seat must first collect $5 donations from 60 individuals to be eligible for public campaign financing. After doing so, he or she can then only spend a limited amount of state matching campaign funds. Senate candidates must collect at least 175 qualifying donations. But the law doesn’t prohibit the candidates from also running a political action committee or prohibit another PAC from spending on behalf of publicly funded candidates. 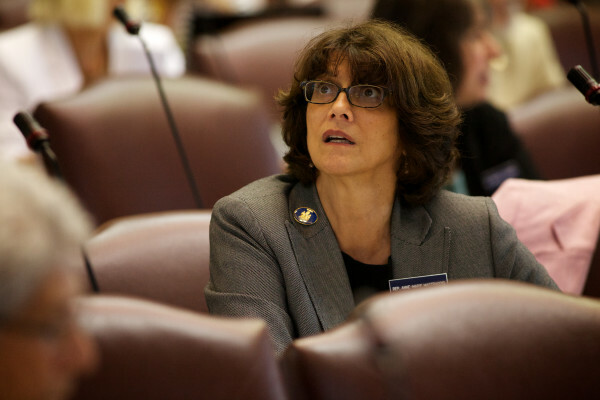 Chenette, along with a bipartisan group of other lawmakers, is pushing a variety of bills to end the practice, arguing that the current practice is unethical and makes it difficult for voters to trace campaign spending. “Both parties have played the game,” Chenette said. In his testimony on a bill offered by state Rep. Anne-Marie Mastraccio, D-Sanford, Chenette said leaders in both parties were running political action committees while also running campaigns for office. “You have an opportunity with this bill to fix a campaign finance system that has blatant backdoor loopholes and allows individuals to create an entire network of completely legal bribery,” Chenette told the committee. A check of state campaign finance records for the 2014 election shows that the current and former state Senate president, one a Democrat and one a Republican, operated leadership PACs. Also collecting PAC donations was the current speaker of the House, as well as the House majority and minority leaders and their assistants. In all, 29 candidates ran leadership PACs in 2014 — and 14 of those also accepted public funding for their campaigns as Clean Election candidates. Twenty-six of the PACs are still active, according to records from the state’s Ethics Commission. Collectively, the PACs raised hundreds of thousands of dollars, with donations coming from business interests ranging from brewing giant Anheuser-Busch to Wal-Mart, and from drug-maker Pfizer to Bangor Savings Bank and General Motors. Many of the PACs took money from other PACs, and many also made donations to other PACs or back to their respective party’s generic PAC. While none of these activities are illegal under Maine law, it is galling for lawmakers — even some who benefited from PAC spending on their behalf — who say the system is anything but transparent and far from being a model for publicly financed campaigns that are beyond influence of special interest money. Especially galling for Mastraccio and others seeking to reform the system are candidates who are running so-called “Clean Election” campaigns with public funds while at the same time collecting private donations for their “leadership” PACs. Mastraccio’s bill, LD 204, would prohibit candidates from running PACs if they were also collecting public financing for their campaigns. She said the message that sends to voters and constituents is one absolutely counter to the principle of trying to remove the influence of money from state politics. Rep. Will Tuell, R-East Machias, a first-term lawmaker, sides with Mastraccio and Chenette on the issue. Also supporting the reforms is former state Sen. Ed Youngblood, a Brewer Republican. Chenette and others are saying they won’t support a ballot question that’s expected to go before voters this year to increase the amount of public funding available to Clean Election candidates if the Legislature doesn’t change the laws around PACs. Also before lawmakers is a bill sponsored by Rep. Heather Sirocki, R-Scarborough, that would only allow first-time candidates to be eligible for public funding. Sirocki said after a candidate runs once, he or she should have enough name recognition to raise private funds for their campaigns. Sen. Eric Brakey, R-Auburn, said he, too, supports reforming the Clean Election system and has a bill that would put a competing question on the ballot that would ask voters to do away with Maine’s Clean Election system. Brakey said, so far, taxpayers have paid over $25 million supporting Clean Election candidates since the system was put in place in 2000.